1945 MILEVSKO, PLZEŇ selection of nálepního sheet and postcard with 6 pcs of stmp with overprint with nationalized CDS MILEVSKO/ 11.V.45 + 4 pcs of special Ppc to liberation of Plzeň US army with mounted overprint stamp. 1945 PROSTĚJOV / comp. of 6 letters, 2x with revolutionary overprints Czechoslovakia 1945, 2x provisional R-razítka, violet frame cancel. 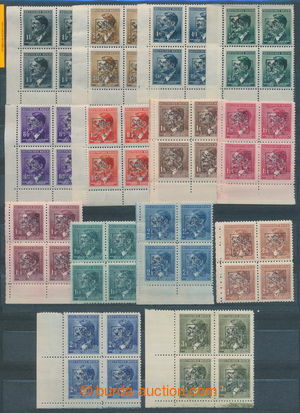 PROSTĚJOV ZBAVEN GERMÁNSKÝCH ZLOČINCŮ etc..
1945 SELECTION of / very interesting selection 20 pcs of letters with revolutionary overprints, i.a. CHOCEŇ, KOSTELEC N. V., SKUPINA Czechoslovak. ODBOJE CARBON, RAILWAYS, STAŇKOV, SUDICE, SEDMIHORKY etc..
1945 [COLLECTIONS] ČESKÉ BUDĚJOVICE extraordinary collection of stamps with three-line black overprint "We thank the Allies for Liberation 5.V.1945" in quite full 16-sheet stockbook A4, contains mainly multiblocks and parts of sheets, i.a. A. Hitler. 10K-50K with coupons, complete 50 pcs of sheet A. Hitler. 4,20K(2x) and 4 Koruna etc.., in addition official letter businessman J. Straky about/by issue this overprint with souhlasem People's Committee, major part stamp. 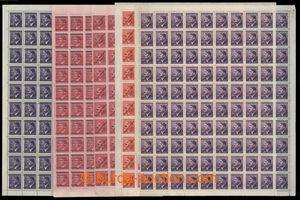 with mark Straka, total over 2.000Ks stamps, quite extraordinary offer! 1945 [COLLECTIONS] extraordinary collection revolutionary overprints on/for ca. 80 old sheets (ex. A. Novotný) in spring folder, contains mainly complete set with overprints on light labels, from ca. 70 various lokací as: BRNO, KOJETÍN, FRENŠTÁT, PROSTĚJOV, BÍLÁ LHOTA, POLICE, FRÝDEK, HOLEŠOVICE, HRADEC KRÁLOVÉ, DOMAŽLICE, SVATÝ KOPEČEK, ROŽMITÁL, RUMBURK, TELČ, TÁBOR etc.., part specialties as inverted overprints, plate proofs Olomouckého overprint etc.., supplemented with about/by ca. 70 entires with revolutionary overprints, for example. 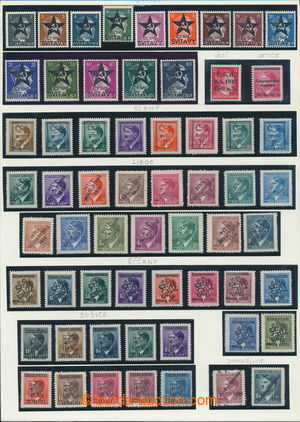 20 pcs of Olomouc issue (eagle); nice and rare collection revolutionary overprints! Pof.A360/362 production flaw, Kosice MS with zdánlivým shift red also blue (!) 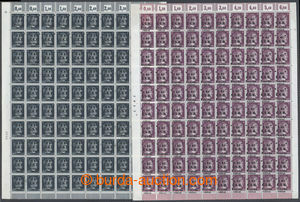 color stamps 2 Koruna and 6 Koruna outside perf incurred shift color grey-green values 5 Koruna, emblem / symbol and "perf" in the direction of downward; mint never hinged gum, only small vertical bend in/at right corner, combination shifts two colors on/for this miniature sheet is exceedingly rare, quite rare offer! Pof.A360/362 production flaw, Kosice MS with rare combinations two expressive production flaws - strong shift red color - (stmp 2 Koruna outside perf) + wide paper crease in LL corner with incomplete printing red inscription; original gum, small spots, quite minimum usage, single square known piece with gum! 1945 [COLLECTIONS] Pof.A360/362, Kosice MS, selection of 74 from 75 basic fields according to Čtvrtečka, so full group of 15 fields combinations 222, 111, 112 and 211 and 14 fields combination 221 (every miniature sheet this combination very rare), missing only 5/221, in addition miniature sheet from field 2, combination 112, with plate variety part of edition, „tlapa“ 2/112 with production flaw significant circle between legs lion in middle emblem / symbol, other circle in stamp 5 Koruna; on sheet Grande, all described, first-time in/at any auction, kompletováno more than 30 years, above-standard quality, quite exceptional offer!